checkmark3 Official partner of Aston Martin. checkmark3 Awesome platform. Low minimum deposit. This is an extensive and objective IQ Option review, in this review, you will be able to find all information you need in order to make up your mind on whether or not you want to trade with IQ Option. Use the following jump links in order to find what you are looking for. This review is primely written for UK traders in mind, however, with that said, IQ Option also offers their services in all of Europe and globally. Though not in the United States. IQ Option review navigation / quicklinks. Is IQ Option a scam? On top of this, you will be able to find tons of information by reading the review. In four years, IQ Option has managed to establish themselves as one of the CFD-brokers on the entire market with more than 14 million active users and 3 million daily transactions. They offer a neat and innovative product with several practical tools and solutions that make trading as easy as it can get. There is no question why IQ Option is considered one of the best brokers in the game. In fact, we can only think of a handful of other brokers that have the slightest possibility to compete with IQ Option, which is why we gladly recommend them to our readers. In the four years since IQ Option was first launched, they have managed to achieve what used to seem impossible and to offer something truly unique. Their products are innovative and act as a breath of fresh air on an otherwise quite boring market. Today IQ Option has over 25,580,000 registered users. If you would compare the 10 leading brokers with each other, you would have 9 brokers that looked pretty much the same and IQ Option on its own. Their interface is playful, the design is clean and practical, and their in-house developed platform is one of our favorites. Because of this, we usually use IQ Option for our own CFD trading and thus feel very comfortable recommending them to our readers. Also, considering that they had over 25,580,000 registered customers during 2017, it’s obvious that we are not alone in sharing these sentiments. IQ Option is by no means a scam but a very high-quality trading product. IQ Option is sometimes referred to as IQOption. However, the correct spelling of the brand is IQ Option. Before we get started with our IQ Option review we would just like to point out that all our reviews are objective, even though some of the brokers pay for exposure on our website (banners etc), we take pride in writing objective reviews and we only review legitimate and regulated products. In this IQ Option review, we will take a look at the platform, the IQ Option demo account and much more. Is IQ Option a scam? How do you set up a demo? This is the most extensive IQ Option review available and we will help answer all your questions. IQ Option has established themselves as one of the leading brokers in the UK and across Europe, thanks to their low minimum deposit and playful trading platform. Moreover, they were early adopters of cryptocurrencies and managed to become one of the leading brokers within crypto trading. IQ Option is available to UK and EU traders. IQ Option is not available to traders in the US. IQ Option is regulated in the United Kingdom, licensed by the FCA to offer their trading platform to UK based traders. The FCA regulation is critical for both UK traders and brokers. The Financial Conduct Authority (FCA) is the regulatory body for financial products such as the IQ Option UK platform. A license from the FCA is a seal of approval as it is very tough to get a license. Only the best brokers will be approved by the FCA. If you are a UK trader, you can expect a safe product, and your money is insured, should anything happen to the broker. IQ Option is also regulated to operate across Europe with their CySEC license. Similar to the FCA UK license, the CySEC license is one of the most respected in the industry. And a must have to even operate in Europe. Other regions – The broker operates in several other regions across the world. Licensed and unlicensed areas. If you are unsure if the IO Option trading platform is available in your country you can visit their website and try to sign up. IQ Option is one of the biggest brokers in the UK and in Europe and before we get started with our review we would like to mention 5 interesting facts about IQ Option that we think everyone should know. IQ Option is not only one of the top brokers, but also one of the most highly regarded companies in the CFD trading world. They have a strong reputation for being honest and fair and provide a great stable product to their customers. Additionally, IQ Option is fully regulated to offer their services in the UK and in Europe, which is the most important factor for any broker that wants to be taken seriously in the business because it means that traders are offered a safe environment. Compared to their competitors, the developers behind IQ Option have managed to create a truly unique and groundbreaking product that feels very different from every other broker out there. The website and platform are playful yet useful and easy to use, but that’s not all. IQ Option has also developed separate industry-leading products such as the cryptocurrency wallet Hodly and the cross-chain platform Open Trading Network (OTN) which will unite all cryptocurrencies under one roof. IQ Option represents some of the most impressive numbers in the industry. Between 2015 and 2017 the number of registered users grew from 8,000,000 to over 25,000,000, and during the same time period, the number of daily transactions increased from 646,000 to well over 1,800,000. Better yet, IQ Option’s projection shows that the broker is on track to increase their influence even further over the coming few years. Instead of trying to offer as many assets as possible, IQ Option has handpicked the most prominent assets from five asset classes including stocks and forex. During 2017, the broker took advantage of the fast-growing cryptocurrency market and now the broker is a leader in the field. In fact, cryptocurrencies are most likely the area that will help take IQ Option to the next level. Today, IQ Option has active accounts in over 67 countries from every available continent, from Africa and Europe to Asia and South America. Naturally, this makes IQ Option one of the most global brands in the industry. Furthermore, the have a strong position in the United Kingdom, the finance capital of Europe. Now, let’s get down to the nitty-gritty and start our IQ Option review. The most important question to ask yourself when choosing a new broker online is if you can trust them. In this case, the answer is as clear as it can get: IQ Option is not a scam. This means that you use all of IQ Option’s features and service without ever having to worry about getting ripped off. This is always one of the first questions we cover, and our review of IO Option is no different. Who is IQ Option? IQ Option is run by a company called IQ Option Europe Ltd. and they have their main office in Cyprus where they are also regulated. Their CySEC license number is 247/14. In a world where most “license and regulation authorities” can’t be trusted, CySEC is unique. Their conditions and regulations are strict and as a broker, you need to keep the highest level of professionalism to even be considered for a license. A good rule is to only use brokers that have a license from CySEC or any other reputable authority such as FCA. Being regulated by these authorities also makes the onboarding process of new customers quite complicated. They have a KYC process that will require you to provide documentation in order to verify your account. And if that wasn’t enough, IQ Option is also the official sponsor of an Aston Martin racing team. We can guarantee you that a well-established luxury brand like Aston Martin would never work with an untrustworthy company. IQ Option has gone through all the steps and introduced all the necessary measures to ensure that their service and platform is safe to use. IQ Option is by no means a scam. Some brokers chose to use a platform designed by third-party providers, MetaTrader 4 is the most common one. Other brokers prefer to design their own platforms which is what IQ Option has done. Designing your own trading platform can be a bit of a hit or miss, but IQ Option has excelled at it. Their platform is of high quality and fun to trade with. It feels stable, it’s clear and easy to use, and it is aesthetically pleasing. More importantly, it makes the trading experience easier for us traders – something we always expect but rarely get to experience. Focus lays on charts and analytical tools, and we couldn’t be happier with that part. The only downside with the IQ Option platform is that we wish it had longer closing times. Most of their underlying assets are limited to the markets opening hours, which is fine if you’re a day trader. However, we know a lot of traders that like to combine shorter trades with investments that last for a few days. Unfortunately, that is not possible on the IQ Option platform. Because of this, we think that IQ Option might miss out on a big group of potential clients that would rather use a broker with more time options. 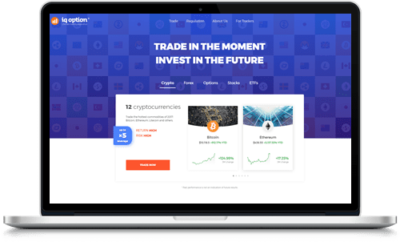 We do however think that the IQ Option platform is one of the best in the industry and the broker is definitely comparable with some of the other big brands including Plus500, Markets.com, 24Option, and Trade.com. IQ Option simply outperforms most other brands. Today, IQ Option provides two different trading accounts. The traditional trading account is what you use to trade CFDs for real money, and the demo account can be used for risk-free trading with actual market conditions. You can read more about the different accounts below. IQ Option offers only one regular trading account without a welcome bonus. This because CySEC changed their policy about bonuses making it illegal to offer money or free products because it encourages trading. Sometimes IQ Option offers exclusive deals and events for traders with a large turnover, but you have to contact their customer service to learn more. However, IQ Option has made a name for themselves by providing exciting competitions and trading tournaments. Read more about the latest opportunities on their website. To recap, IQ Option only offers one trading account and the same conditions apply to everyone, no matter how much money you spend. It is easy to sign up for the trading account and you can start trading for real money today. On top of their regular trading account, IQ Option has a free and completely unlimited demo account. It takes no longer than 1 minute to create an account to start trading in a risk-free environment, and it doesn’t require a deposit or that you submit your bank information. As the icing on the cake, the demo account is unlimited which means that your amount of virtual money gets refilled every time you reach a certain minimum level. 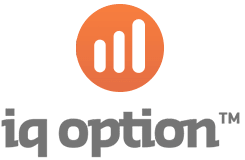 Is IQ Option offering a demo account? Yes, of course, any broker in the UK pretty much has to offer a demo account, just to keep up with the competition. The IQ Option demo account is quite well known in the industry as it offers great opportunity to practice and full access to the IQ Option platform. Normally a demo account usually comes with some restrictions. The IQ Option demo does not, you get access to it all. If you are looking to register a demo account we can highly recommend IQ Option, it is one of the best demo accounts you can sign up for. Head over to IQ Option and register a demo account. No verification process is required for the demo. You will need to submit some basic information like your full name. Get full access to the IQ Option trading platform through the demo account. There is one downside to using a demo account and that is the psychological part of it. Humans tend to take bigger risks when trading with fake money and if you’re not careful when switching from demo to regular trading you might end up taking unnecessary risks with your own money. All you need to avoid this is a little bit of common sense. CFDs are leveraged products, and you must educate yourself on this matter before you start trading. We have written a helpful leverage guide that you can check out and IQ Option also provides information on the subject. Basically, all the best CFD brokers are offering leveraged trading. Leverage is a method that increases your exposure on certain assets through money that you borrow from the broker. This means that you can invest small amounts of money and make large profits from small market movements. It also means that you increase the associated risk. Because of this, IQ Option checks every new client’s understanding of leverage before you’re allowed to start trading. IQ Option’s leverage is currently different depending on where you reside. In the past, brokers were allowed to offer leverage that increased the value of your trends several hundred times, but today there are regulations in place for the European market. The European Securities and Market Authority – the authority that oversees trading in Europe – decided to limit the number of leverage brokers are allowed to offer in order to protect clients. This means that IQ Option’s leverage is limited to the following. As you can see, this is quite a drastic change, but it’s done in order to protect you and your funds from unnecessary risks. These are the maximum levels offered to European traders, and IQ Option has the right to limit customers even more. And if you live outside of Europe, your IQ Option leverage might be higher. The IQ Option Trading App is a great alternative with slightly reduced functionality. IQ Option designed a platform that is compatible with most mobile devices but with limited functions. It is best suited for simple analytic tasks and to keep track of ongoing trades. That being said, the app is of the highest quality and we have never experienced any issues with it. The IQ Option trading app is available for iOS and Android. When comparing the IQOption trading application to many of the competitors it is very clear that they are one of the best in the business. People today simply demand a good mobile version of the trading platform as desktop versions is becoming less popular. On mobile, the trading is available 24/7 and at your fingertips. IQ Option has realized this and put a lot of effort into developing a really good mobile application. The IQ Option app is available to UK traders, traders in Europe, and most other regions. Opening an account with any CFD broker requires you to go through a specific process divided into several steps. The process and requirements you have to fulfill have little to do with the actual broker but are set up by the regulatory bodies that oversee the industry. The FCA demands that the UK based brokers have a strict registration process. This means that the process is very similar regardless of which broker you sign up with and it also means there is no way around it. If you want to trade with an authorized broker, you will have to comply with the rules. That being said, the process is neither hard nor does it require too much from you. In fact, the registration with IQ Option is pretty straightforward if you make sure you are prepared and have the needed documents at hand when you get started. Sometimes it can take a bit of time for IQ Option and other brokers to verify all your information. In order to make this as clear and detailed as possible, we will divide the registration process into 4 steps and we will provide with tips and guidance to best make it through the process. If you already have created an account you just have to login. The first thing you have to do before you can continue is to submit personal information that will be used to verify that you are you but will also help create your account and keep you safe in case something happens. This part of the process is the easiest, and you’re probably already familiar with it if you’ve ever signed up for any other service online. IQ Option will ask you to provide your full name, address, phone number, email address, and other basic information. Make sure that you only provide correct information because you will have to verify it in the next step. After the first step, you’re usually provided limited access to IQ Option’s services, meaning you can check out the website and see how your account will be set up. This next step is for IQ Option to confirm that you really are who you say you are. This is their opportunity to double check that you are old enough to trade and that you live in a country where CFD trading is allowed. Most of this information will also be shared with CySEC and FCA, and they will use it to help protect you if anything would go wrong or if there would be any issues in the future. A photocopy of your passport, driver’s license or national ID. The picture must be clear and all your information must be easy to spot. If the picture you submit isn’t good enough, IQ Option can request for you to do it again or even deny you access, so take it seriously. You will also have to submit a copy of a utility bill or a bank statement. The important part here is to make sure that the document you submit shows both your name and the address you submitted during step 1. Also, the document can’t be older than three months from the time of uploading. Leveraged CFD trading is associated with high risk, and one of the requirements for a broker to be authorized by one of the regulatory bodies in Europe is to inform their customers of the risk. As a part of the deal, they are also forced to make you take a test regarding CFDs and leverage in order to determine your level of knowledge. The test is very straightforward and won’t take very long to complete. After you’ve answered the questions, IQ Option will automatically evaluate your answers and then provide you with leverage limits suited for your personal knowledge. The better you score on the test, the higher your limits will be. 4. The last and final step is to fund your account with your first deposit. Compared to other brokers that often require you to deposit a few hundred dollars, IQ Option’s minimum deposit is $10. You will have to provide copies of your credit or debit card if that is your preferred deposit method. However, we suggest you use something quicker and more practical such as Bitcoin or Neteller. And that’s it. You can start trading after you’ve completed all the steps and IQ Option has verified you, and you’ve made your first deposit. Note that IQ Option has the right to deny anyone at their own discretion and they can ask you to provide additional information as a part of the registration process. IQ Option constantly works with the improvement and development of their trading platform. In fact, IQ Option is one of the brokers we want to give an extra high grading on this particular area as they are miles ahead of their competition when it comes to being innovative. They are constantly pushing the limits and introducing new elements to their trading platform. In this section, we will try to keep up to date with some of the biggest new features on the IQ option trading platform. We have clarified that IQ Option is one of the most innovative and trustworthy businesses on the market, and we have also talked more about the different accounts they offer. Now it’s time to take a look at the different assets you can invest in using IQ Option. As the name proposes, IQ Option first became established in the industry through binary options. 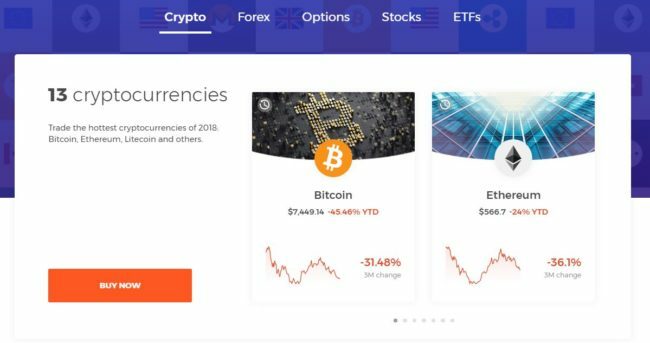 However, during their four years on the market, they have completely changed their focus to a more serious market and today they offer forex trading, stocks like CFDs, and cryptocurrencies. You Can No Longer Trade Binary Options with IQ Option – IQ Option was first launched as a binary options broker but that is not the case anymore. During several years, IQ Options started switching their focus to the CFD and forex market and today they don’t offer binary options anymore. Also, in April 2018, the ESMA, European Securities and Market Authority changed the regulation, banning binary options trading and IQ Option are, of course, following those rules. This means that IQ Option is now a CFD broker in every sense of the word. Professional traders can still get access to binary options and high leverage. In order to qualify as a professional trader, you need to meed 2 out of 3 criteria. Worked in the financial sector for over 1 year with duties that required insight in transactions or services offered. Forex Trading with IQ Option – With this forex broker, you have the option to invest in currency pairs, also referred to as the forex market. Currencies are exciting and very quick derivatives, and also one of our personal favorites. The goal is to buy a currency pair for a low price and then sell it when the exchange rate is higher, thus making a profit from the price difference. IQ Option offers 22+ currencies (more than 100 currency pairs) which is more than enough for most people. For example, you can trade with American dollar (USD), British pound sterling (GBP), euro (EUR), Swedish krona (SEK), Turkish lira (TRY), and many more. 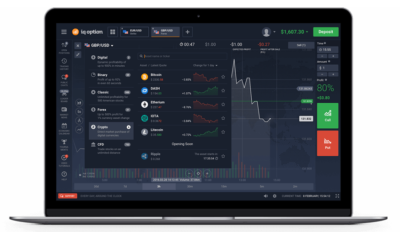 Crypto trading with IQ Option – IQ Option was an early adopter of cryptocurrencies and has long been recognized as one of the leading brokers for trading them. With Hodly, their very own crypto wallet, being launched we must say that IQ Option is our favorite broker for cryptocurrencies. IQ Option is currently offering between 12 and 16 cryptocurrencies. For more insight in the IQ Option crypto trading, you can jump down a bit in this review. Trade stocks with IQ Option – IQ Option is also a great stockbroker offering a whole bunch of stocks that you can trade via CFDs. You were not always able to buy stocks at IQ option and even today they are not specialized in stock trading although still pretty good at it. If you are looking for volumes you can find other brokers who offer more stocks. IQ Option is currently offering 478+ stocks that you can trade via CFDs (contracts for difference). Everything from Netflix to Micron Technology INC. Looking to trade Stocks? IQ Option may be the right choice for you. You can find more information about IQ Option stock trading if you jump down a bit. Trade EFTs with IQ Option – EFTs are a great way to diversify your trading portfolio. If used right EFTs are also a great way to reduce risk. We are quite certain that cryptocurrencies are the future of payment methods online. In our opinion, it’s a natural development, and we can see how physical cash is slowly being phased out and how cryptocurrencies are taking more room. Every new generation requires a greater digital need, and before we know it Bitcoin might be the official currency everywhere. The problem with cryptocurrencies is that they are unstable, at least if you want to use them as a method of payment. In contrast, the fluctuating nature of cryptocurrencies creates perfect conditions for day trading, especially for CFDs. Since you can speculate on both upward and downward moving trends, CFDs and cryptocurrencies go hand in hand. And in 2017, IQ Option decided to join in on the hype. At the time of writing, IQ Option offers 12 of the most popular cryptocurrencies. Among them, you’ll find Bitcoin, Ethereum, Litecoin, Ripple, Bitcoin Cash, Monero, IOTA, QTUM, Stellar, NEO, Bitcoin Gold, ZCash, Dash, and TRON. IQ Option is constantly adding new cryptocurrencies. Cryptocurrencies can either be bought as long-term investments or as shorter trades in a day trading format, and IQ Option has decided to focus on the latter. IQ Option has launched a new cryptocurrency wallet under the name of Hodly. Hodly is IQ Option’s very own and dedicated cryptocurrency wallet, and we have to say that the wallet is a great option. One of the biggest obstacles to why people have avoided trading cryptocurrencies is because it has been too complicated setting up a wallet -something that Hodly is working really hard on changing. The goal with Hodly is to help to store cryptocurrencies in a more simple way yet safe way. Setting up a wallet for cryptocurrency storage today is a quite complicated process. Trade Stocks as CFDs – IQ Option also lets you trade stocks but in an alternative way. Instead of providing access to the world’s stock exchanges, they use something called a CFD. This type of investment is a speculative one that has you investing without ever having to buy the actual shares. Your job is to predict how the price of a stock will develop and then invest in that prediction. Unlike options, CFDs are securities but instead of buying the stock you buy a contract based on its price. You could call it a hybrid of security trading, speculative trading, and actual stock trading. We understand that it might seem confusing, but trust us when we say it’s easy to get a grip on. IQ Option also provides an extensive educational program for all of the above-mentioned markets and so do we. 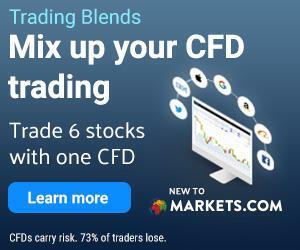 Check the sections in the top menu to find comprehensive guides on every popular CFD market and don’t forget to check out our news segment for the latest trading news. Lately, IQ Option has also put a lot of effort into publishing useful information about digital currency trading and CFDs. They have everything from tutorials and educational videos, to examples and ebooks. Note that we have heard rumors that they are going to add ETFs to their selection, but we haven’t been able to confirm it yet. In order for IQ Option to offer their services in Europe and the rest of the world, they need a special license and to be regulated by a reputable authority. IQ Option has a license from Cyprus Securities and Exchange Commission under license number 247/17. Getting a license from Cyprus Securities and Exchange Commission (CySEC) is not an easy task so any broker given such a license can be trusted. You have five options to choose between for depositing and withdrawing money from your IQ Option trading account. Some people might think five options is a bit limiting but we think it is enough. There are definitely brokers that offer more options, but these five are the most common ones. Visa/Mastercard/Maestro – Deposit money with your regular credit or debit card. Bank transfer – Transfer money from your bank account to IQ Option. WebMoney – You can use the online payment method WebMoney to deposit money into your account. Skrill – Deposit money with one of the world’s leading online payment methods. 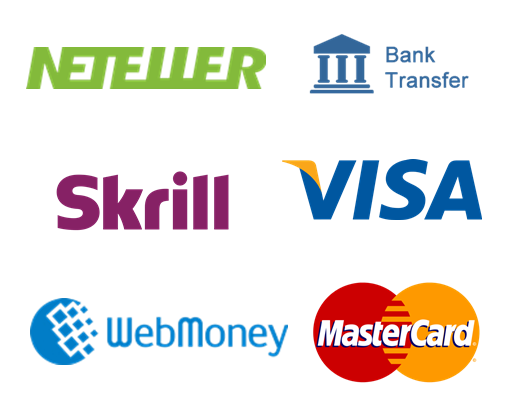 Neteller – Use the second biggest online payment method after PayPal. Note that IQ Option doesn’t charge fees or commission for the above-mentioned methods, except for a bank transfer. The price for bank transfers is different depending on your bank and where you live, so we recommend that you check what applies to you before using this option. The smallest deposit is $10 which is perfect for all recreational traders that can’t spend too much on trading every month. This is something that separates IQ Option from many other brokers out there as the minimum deposit otherwise usually is around $100-$250. For a recreational trader, this is quite a bit of money. Please also note that we have not tested all payment options in our review, just the bank transfer option. If you experience any positives or negatives with any of the other payment methods be sure to leave a comment in the comment section. You might already understand why we consider IQ Option to be one of the top brokers in the market and we think that most of the features are incredibly well thought out. However, if there is one thing that we would like to see improved and wished was fairer it would be the fees and spread. Compared to many of their competitors, IQ Option has very high spreads for trading, especially cryptocurrencies. In fact, the spread for cryptocurrencies can be anything from between 2.5 percent all the way to 10 percent. Another thing we don’t like is that IQ Option advertises that they have “Competitive Spreads,” which isn’t true since it’s higher than the average. On top of the spread, IQ Option takes out a 2.9 percent fee, or commission, for every cryptocurrency trade (buy and sell) completed on the platform. In addition, the broker charges an overnight fee for holding cryptocurrency and stock CFDs overnight. With that said, IQ Option’s fee and commission system can feel quite confusing and we suggest you contact the IQ Option customer support if you have any questions. It’s important that you have an understanding of what each trade will cost before you get started so that you don’t get disappointed. Note that forex trading is commission free on the IQ Option trading platform which we think is very fair. IQ Option’s customer service has been rewarded with several prizes since 2013, and it is obvious that good customer service and relations are important to them. We ourselves have been in contact with them several times and have been pleased with the service we’ve received. IQ Option has now launched a live chat function, on top of that they offer several regional phone numbers so getting in touch via phone is an option. If you are not comfortable contacting via phone then email is currently the best option. Many brokers today do not offer phone support so this is a massive advantage to IQ option. Many traders today want to be able to get first class support via phone call. Update on live chat: You can now contact IQ Option via live chat. So to summarize this you have 3 easy options to contact IQ Options. Send an e-mail to their support: [email protected] They will answer your question very fast, usually within a couple of hours. You can call the IQ Option support team 24/7. Phone number depends on what country you are from. Head over to the IQ Option website and find your local number. Live chat. This is one of our favorite options, you will get a reply within seconds. 2017 Award of Excellence – This acknowledgment is awarded by The Academy of Interactive & Visual Arts and it’s the highest honor one can get at the Communicator Awards. It was given to IQ Option for their innovative trading app that excelled in the financial industry. Century International Quality Gold Era Award – Was given to IQ Option for their outstanding commitment to providing a high-quality product in the realm of customer satisfaction. This particular award was awarded by the Business Initiative Directions Group. Best Technology Application – In 2016, IQ Option received another award for their industry leading trading app that they’ve worked tirelessly to perfect. This time it was The Web Marketing Association that awarded IQ Option. Most Reliable Binary Options Broker – Before binary options were banned in 2018, IQ Option was awarded several awards for their safe and very serious binary options product. One of the most important awards they ever got was this title from Master Forex-V.
We often get questions about IQ Option and about what services they offer. Here are some of the most common questions we get about IQ Option with detailed answers to them all. It’s a collection of questions that we have gotten about IQ Option over the years, questions that we often read online as well as questions that we know most people have about CFD brokers in general. Since we’re always receiving new questions we will keep updating this section when needed in order for it to be as accurate as possible. And if you have a question that’s not answered below we encourage you to leave a comment with the question below and will try to answer you as soon as we can. 1. First and most probably most importantly: What is IQ Option? IQ Option is one of the leading trading platforms out there. In our opinion, looking at platform only, it is the best platform for trading right now. With IQ Option you can trade Binary Options, Digital Options, Forex, and Cryptocurrencies. 2. What types of accounts does IQ Option offer? IQ Option offers three different types of accounts. Practice account – Suitable for people looking to try out the platform. IQ Options demo account is free and easy to use. Real account – Suitable for anyone looking to invest real money. this is the standard and most common account type. The standard account comes with the possibility to trade with real money and to use the IQ Option platform. To be honest there are not many limitations to the standard account. 3. How does IQ Option make money? IQ Option has fees on buying, selling and trading. The fees vary depending on many factors such as what type of trading you do, what assets you use and which cryptos you buy. 4. What is the minimum deposit with IQ Option? The minimum deposit with IQ Option is €10. This is lower than most other brokers. 5. How do I create a real trading account? First of all, you need to register. Follow any link in this review pointing to IQ Option and you will be able to find the registration form. Once you register you will automatically have an account with two options. One will be a demo account with a certain amount of virtual money to spend and the other will be a real account. To trade with the real account you will simply have to make a deposit. Once that is done you can start trading with your real account. 6. How do I verify my account? All regulated clients have to verify their identity within 7 days after account registration. You verify your account by uploading a government-issued ID and Proof of Residence, for example, a utility bill in your name. Documents can be uploaded to the trading account. Non-regulated clients only have to provide documents upon withdrawal of funds. In addition to that, in case a client withdraws money to a bank card, he has to provide pictures of that bank card from both sides. The verification process is necessary for your safety. 7. Apps for Android? PC? iOS? PC, iOS, or Android? IQ Option has a great application for all devices and on the most popular operating system including PC, iOS and Android. In fact, the IQ Option platform works better with the applicated. It also runs in your web browser but if you are looking for high performance it is generally recommended to download the application. 8. How do I withdraw money? In order for you to withdraw your hard-earned money from IQ Option you will have to navigate to “withdraw funds”. Once you go there you will be presented with different withdrawal methods. You will have to pick a preferred method and once you request a withdrawal it is usually handled within 24 hours. 9. How long do I have to wait until I get my money if I withdraw funds? IQ Option are doing their utmost to process all withdrawal requests within 24 working hours. Once the withdrawal has been taken care of on IQ Options end it depends on what payment service provider you use. Some payment providers are fast, like skrill and Paypal. Banks are usually slow and will require up to 5 days in some cases. 10. Is there any documentation required to make a withdrawal? 11. How do I start trading with the IQ Option platform? If you have not used IQ Options platform first our recommendation is that you try out the free demo account and that you go through the tutorial videos provided by IQ Option. The videos will give you a solid understanding of how the platform works. We also recommend that you don’t start trading until you feel comfortable. Get to know the platform before you get going. 12. How do I trade binary options? Binary options are no longer available within the European Union or on IQ Options platform. During the past few years, IQ Options have slowly changed their focus from binary options to CFD trading, and when ESMA decided to update their regulations on binary options, IQ Options stopped offering them all together. 13. What are digital options? Digital options used to be a high-risk version of binary options but they are no longer available on IQ Options. In fact, IQ Option does not offer binary options any longer to any of its customers, see above. 14. What is CFD trading? CFD is short for Contracts for Difference. It is a contract between two parties, in this case, you and IQ Option, who speculate on the price of an underlying asset. With IQ Option you can trade CFDs on Cryptocurrencies, Forex, and Stocks. If you are new to CFD trading and/or the IQ Option platform we recommend that you look at all tutorials relating to CFD trading. Also, please be aware that CFD trading is a high risk and high reward trading style. Always educate yourself to minimize the risks. 15. How does IQ Option's multiplier work? 16. What is OTN? And what are OTN-Tokens? OTN is short for Open Trading Network and its a platform that aims to unite all isolated blockchains platforms and participants in the market. OTN is partly financed by IQ Option and OTN-tokens are supported by the IQ Option trading platform. You can read more about the OTN project here: https://otn.org/. OTN-Tokens are being distributed on the IQ option platform by IQ Option. You can get these when trading. Then what you choose to do with them is up to you. They work like any other cryptocurrency. OTN tokens can, for example, be used as a means to pay the commissions when buying a cryptocurrency with IQ Option. OTN-Tokens may also have the ability to be converted into OTN coins once the OTN-Platform opens up its doors. 17. 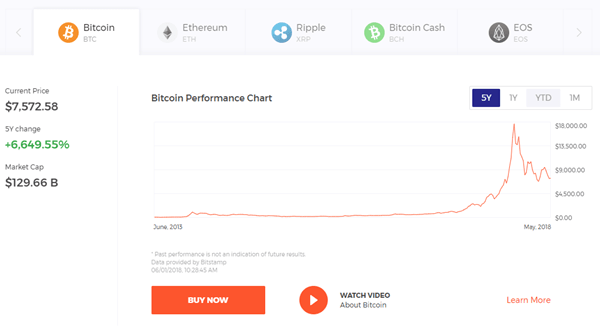 What cryptocurrencies can I buy and trade with IQ Option? Right now there is minimum 14 cryptocurrencies available to buy at IQ option. Bitcoin, Ethereum, Litecoin, Ripple, Bitcoin Cash, Dash, IOTA, QTUM, Stellar, TRON, Bitcoin Gold, ZCash, Monero, and NEO. However, IQ Option is quite active with adding cryptocurrencies. We foresee that they will offer more in the future. 18. Is IQ Option available wordwide? In most other countries IQ Option should be able to operate and accept customers. This may change in the future as we are facing stricter regulations. 19. How do I contact IQ Option? IQ Option’s customer service consists of a team of highly knowledgeable support staff that can help you with any question or issue you might have. To get in contact with IQ Option you either send an email and wait a few hours to get a response or you call the team and get help within minutes. IQ Option has several phone numbers depending on where you are in the world and what language you speak – check their website for the best number for you. Although, both of these channels are a bit slower than we’re used to and our favorite way of contacting IQ Option is via live chat. You can open a live chat session at any time on the IQ Option website and you will be connected to a staff member within seconds. For email addresses, phone numbers, and other contact information we suggest you check the “Customer Service” section in the review above. 20. Can I trade leveraged assets with IQ Option? Absolutely! IQ Option is a CFD and for broker and all CFD and forex contracts are leveraged. If you don’t know what leverage is we encourage you to learn as much as you can about it before you start trading. Leverage and margin can increase your profit tenfold but it can also increase your risk. Before signing up and depositing money, IQ Option will ask to review your financial skills, especially regarding leveraged trading. 21. How do I open an IQ Option demo account? Opening a demo account with IQ Option is much easier than opening a regular trading account. Follow one of the links on this page to be directed to the sign-up page when you push the demo button. After that, you provide IQ Option with some personal information and you’re ready to start demo trading. No deposit or verification is needed to start trading with an IQ Option demo account. Your demo account can later be updated to a regular trading account, making it a great way to get started with IQ Option. As always, we recommend that everyone activates a demo account since it can have benefits for any type of trader. Also, the demo account is unlimited meaning IQ Option refills your virtual balance when needed and it’s also not restricted meaning it gives you free access to the complete platform. No one is perfect in this world and even one of the world’s top brokers has a few things that they could work on improving. For example, compared to many of their competitors, IQ Option’s selection of assets is quite small. And even if this isn’t a problem for most, it can be restrictive and repetitive after a while. We have heard that they are working on adding more assets, but so far we haven’t seen any real updates. Another thing that many professional traders don’t like is the lack of advanced analytic tools. For beginners, IQ Option is great and they provide all the tools you need and then some. However, if you’re a professional day trader that trades on several markets for hours on end every day, the number of tools and opportunities can make you feel like you’re being held back. The last issue that we and many others have commented on is IQ Option’s fees and high spread. It’s just a little higher than what is justifiable, and most of their competitors manage to have lower spread which has us thinking that it must be possible for them to lower their fees. 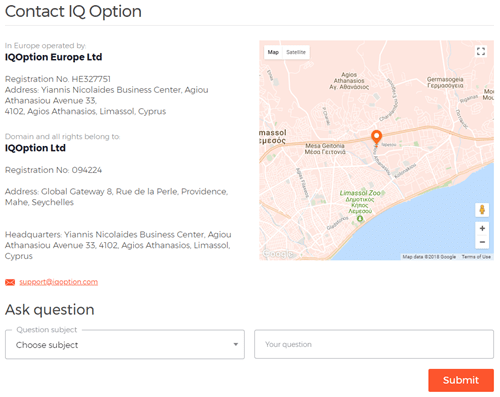 We have already mentioned that IQ Option has several local offices spread out around the world, however, the main operating IQ Option headquarter is located in Limassol, Cyprus. In fact, IQ Option has a complete building that’s just theirs and that looks like a futuristic art project. It is obvious that the office space has been inspired by the new playful and trendy design that companies such as Google and Airbnb started a few years ago. According to previous workers, the tempo is high at the office but the atmosphere is relaxed. In addition, IQ Option employees are offered great benefits such as free health insurance, 13 months yearly salary, and free daily lunch. What Do Experts Have to Say about IQ Options? We have gathered a few knowledgeable people from the trading industry to ask their opinion on IQ Option, below you can read what others have to say about the innovative broker. Personally, I think IQ Option is the most prominent broker in the industry for several reasons. However, the part that strikes me the most is how well-designed and easy to use the platform is. In fact, in today’s market, most brokers are using features and designs that are several years old which makes them feel outdated and hard to take seriously. The lack of drive is a major concern. IQ Option, on the other hand, provides a state-of-the-art product that’s like nothing I’ve ever seen before. They dare to challenge the perception of what a broker is supposed to look and feel like, and by doing so, IQ Option is pushing the market to new heights for everyone. Let’s be honest, any broker that struggles to keep up with the rapid development of the industry that IQ Option is spearheading will soon be forgotten. For many years IQ Option has been my first choice for trading certain assets. Mainly cryptocurrencies. IQ Option excels at cryptocurrencies and now they are taking it to the next level by adding Hodly. A very simple cryptocurrency wallet. They also offer a really good platform that in fact might as well be one of the best in the industry for semi-professional traders like myself. The platform is beautiful to look at and very easy to use, it also comes with great functionality. The platform performs well on both desktop and mobile. I usually prefer to buy on desktop but to monitor and sell on mobile, so mobile functionality is extremely important to me. When it comes down to it IQ Option is one of the most interesting brokers out there today, they offer a truly amazing trading platform that gives us an entertaining and good trading experience. Not only is the platform suitable for beginners it also comes with the advanced functions that more experience traders usually are looking for too. IQ Option also offers a free demo account with uncompromised access to the platform. You can try it without committing to it. On top of this, they have a good selection for forex trading, for cryptocurrencies and a decent selection for stocks. One of the most interesting aspects of the broker is how innovative they are. Always updating and adding new functions and features. The broker is regulated and licensed and safe to trade with. They could, however, improve in certain areas. It would be nice to more stocks on the platform, they are in fairly short supply now. And the fees can always be discussed however they come with every CFD broker and are a necessary evil. We hope that you have enjoyed our IQ Option review. If you still have any questions feel free to ask them in the comment section below. Also a note on our comment section, we are working hard on IQ Option to make sure the brokers really follow up and replies to all questions. Be patient and check back regularly to make sure you don’t miss the reply. Now for all of you who are ready to start your IQ Option account, we wish you the best of luck with your trading. We reached out to IQ Option in order to conduct an interview with them and we got a chance to sit down with Alina, the VP in their affiliate marketing team. We asked her 5 simple questions we think ar relevant for our clients and readers. 1. Before we get started with the nitty gritty, who are you and what is your role at IQ Option? My name is Alina, I am the VP of affiliate marketing in IQ Option. Mainly, I’m in charge of all types of affiliate relations in our company, and our team develops the most user-friendly experience for marketers who run their websites or ads for spreading the word about IQ Option. 2. Tell our readers a little bit about the IQ Option brand. IQ Option is one of the leaders in online trading. Behind IQ Option is a great team that values hard work, integrity, and innovation. Our mission is to create the most exceptional trading platform out there, and we take pride in what we do. 3. Why should our clients pick you over other brokers? Your clients should pick IQ Option because we are committed to delivering the ultimate trading experience. Every platform feature, every update is developed with traders in mind. We strive to provide clients with excellent trading tools and outstanding customer support. Traders are at the core of everything that we do. 4. How do you plan to stay ahead and remain one of the most innovative trading products today? I believe IQ Option has become what it is today because we always look into what we can do to improve the platform. Comments and concerns from traders are taken seriously. Instead of focusing on our competitors and what they are doing, we focus on delivering what our clients want and expect from us. Sticking to our values is what enables us to stay ahead. 5. What is your take on the stricter regulations we are facing today? The general attitude towards regulation is that it is something negative. I don’t consider it to be that way. Regulation is not the end of the world. In fact, it can come with its own potential benefits. Of course, stricter regulation means change, but change can help us evolve into an even better trading platform. We want traders to know we will always do our best to meet any new regulatory requirements that come our way.